High tunnels, also called high hoops or hoop houses, are temporary structures that extend the growing season. These covered structures are constructed in the field in order to protect crops from the weather (rain, wind, cool or warm temperatures), as well as in some cases, pests. High tunnels offer an intermediate level of environmental control - a growing system between row covers and greenhouses. In comparison to greenhouses, they are unheated, provide less climate control, and are less expensive. However, the distinction between a greenhouse and high tunnel is not always clear; structures exist in a continuum between expensive, climate-controlled greenhouses and inexpensive, plastic-covered PVC pipes. High tunnels are of sufficient height so the farmer can walk through them and tall staked or trellised crops can be grown; this differentiates them from low tunnels, although again, the distinction between low and high tunnels is blurry. 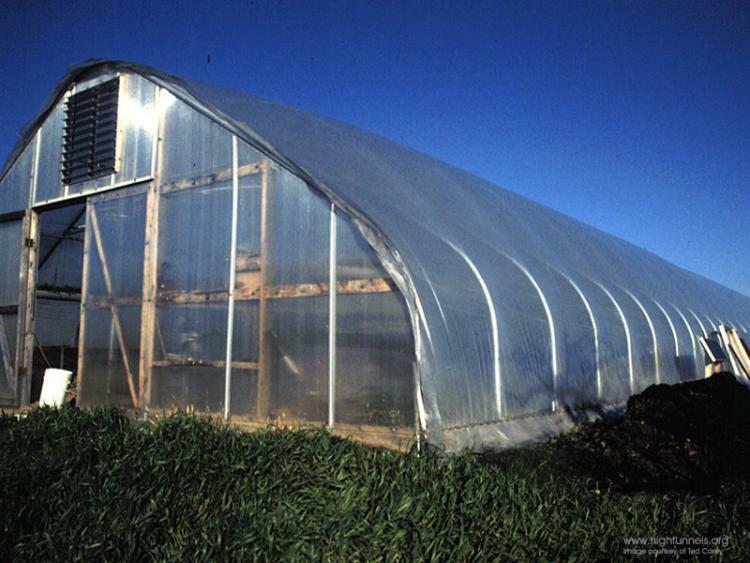 More permanent high tunnels are generally quonset- or gothic-shaped. They are most often constructed of metal bows which are attached to metal posts, driven into the ground. They are typically covered with one or two layers of 6-mil greenhouse-grade polyethylene, and are ventilated by rolling up or removing the sides or ends. There are various designs each offering advantages and disadvantages. Due to their permanent nature, care should be given to siting the high tunnel properly. The quonset-style hoop house has historically been the most popular high tunnel shape due to its simplicity. However, the circular shape limits the height at the sides of the high tunnel, limiting its use for crop production. In addition, the quonset shape cannot easily support a snow load, so the structure must be strengthened or the plastic must be removed before winter in regions that receive snowfall. More permanent, gothic-style high tunnel. Photo credit: Ted Carey, K-State Horticulture Research and Extension Center. The gothic style is rising in popularity due to the problems associated with the quonset style. 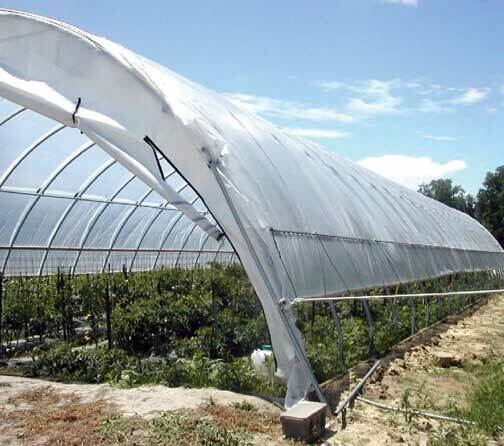 This peaked design allows for greater height along the sides, making the sides of the high tunnel more useful for crop production and resulting in a 15% greater growing space than the quonset. The peak also sheds snowfall. In addition, the quonset shape increases the amount of light infiltration, which results in higher temperatures and improved crop growth. Low cost, movable high tunnel. Photo credit: Tim Coolong, University of Kentucky. In the low cost, movable high tunnel system pictured above, pieces of steel pipe with an auger-turn at the end stabilize the PVC bows. Ropes help tighten the tunnel and improve end-wall stability. This type of construction is inexpensive and movable (allowing for easy crop rotation), but the area covered is relatively small and the height doesn't permit the production of tall/staked crops. High tunnels have many uses on the farm. In cooler climates, their main purpose is to elevate temperatures a few degrees each day over a period of several weeks. This typically results in faster plant growth and higher yields. In climates like western Oregon and Washington, high tunnels are also used to protect crops from the winter rains and to raise night-time temperatures during the summer. 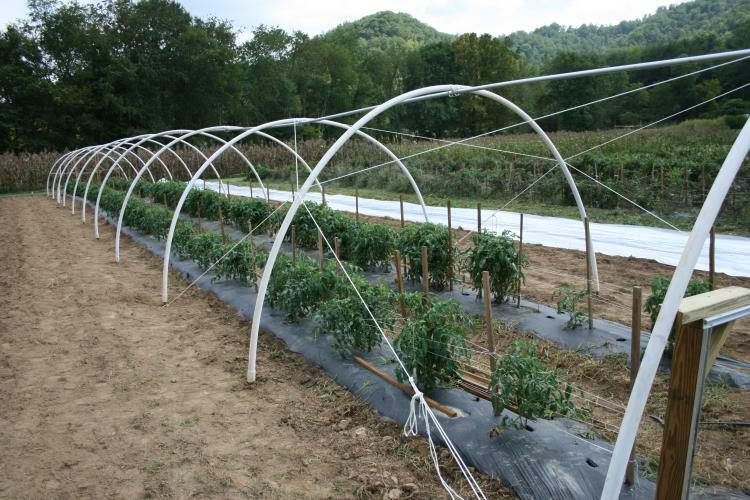 High tunnels can also be used to shade crops, protecting them from heat and sun scald. Regardless of the region, high tunnels help growers produce crops outside of the normal season, thus meeting consumer demand on either end of the production curve when competition is lower and prices are higher. The modified climate inside the high tunnels also creates the opportunity to produce crops that can't normally grow if unprotected, diversifying the farming system. By helping protect crops from weather-related damage, such as sun scald, wind bruises, and hail spots, and from pest damage, high tunnels can provide a higher percentage to top-grade fruits and vegetables at harvest. High tunnels can also support row covers or other materials to protect the crop from pests (insects, wind-disseminated weed seeds, or wildlife), reducing the need for pesticides and/or labor and producing a higher quality crop. 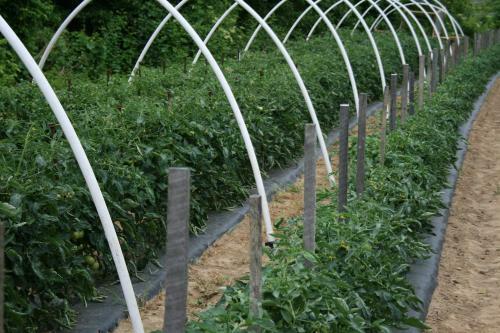 The tunnels are versatile and can be used to produce many crops, including vegetables, small fruits, and flowers. This picture shows the benefit of growing tomatoes inside a high tunnel. The plastic has been removed to show a side-by side comparison of tomatoes grown inside the movable PVC-hoop high tunnel (on the left) and those grown outside the high tunnel (on the right). All plants are the same variety (Mt. Crest) and were planted on the same day in late April 2008 in Johnson County, Eastern Kentucky. Photo credit: Tim Coolong, University of Kentucky. One of the primary disadvantages of the more permanent high tunnels is the fact that they are not easily moved. 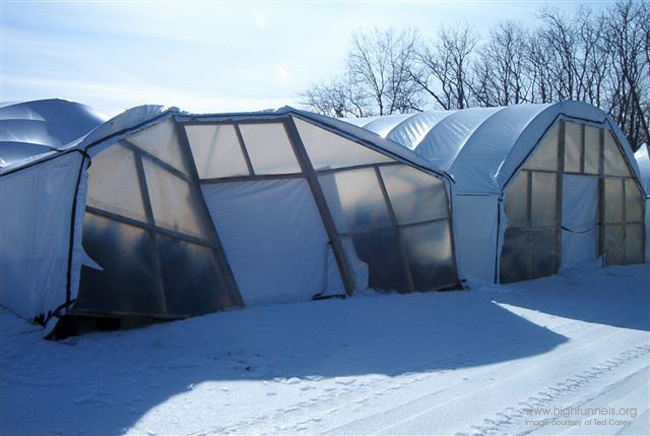 Some high tunnels are engineered to be (and advertised as) easily movable. However, they are typically not very easy to move, and many high tunnels are never moved. The result of this is that the same crop is grown in the same location every year, or a very short rotation is practiced. A short rotation or no rotation in vegetable production may lead to yield reductions and, depending on the crop, soilborne disease development (see related article, Managing Diseases of Organic Tomatoes in Greenhouses and High Tunnels). Organic growers considering high tunnel production should have a rotation plan in place for each tunnel (this will be easier if you have many tunnels) or devise an efficient strategy for moving the tunnels every few years. This is one reason that growers use movable high tunnels, such as Haygrove-type movable tunnels, or the PVC tunnels described in the related article, Low Cost High Tunnel Construction. Another disadvantage to high tunnel production is the lack of exhaust fans for venting during hot weather. In most regions where tunnels are used, tunnels will overheat at some point during the crop production season unless manually vented, or unless an automated ventilation system is used to roll up the sides as the temperature inside the tunnel rises. On warm sunny days, air temperatures in poorly vented tunnels can easily be 40o F greater than ambient outside temperatures. To carry tunnel production through late spring/early summer, which will be a necessity in many regions of the U.S., tunnels must be designed with adequate ventilation and/or easily removable plastic. 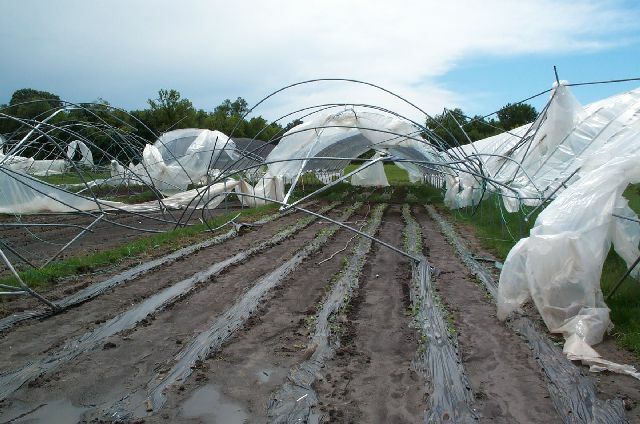 Another disadvantage of high tunnels is that they can be destroyed by high winds, snow, and ice, as they typically do not have the strength of greenhouse structures. Tunnels should be designed to withstand or avoid these stresses. Multi-bay quonset tunnels damaged in severe thunderstorm in August of 2004. Photo credit: Ted Carey, Kansas State University. More permanent high tunnels can be expensive - costing as much as $2.50 a square foot. The less permanent structures cost considerably less. Regardless of the type of tunnel, tunnels increase production costs relative to field grown crops, so crops grown in tunnels must be able to return a higher price, or confer some other advantage to the farmer, relative to the same crop grown in the field. For most farmers, the advantages of high tunnels outweigh the disadvantages. Thousands of fruit and vegetable farms in the U.S. successfully use high tunnels to extend the growing season. An organic farmer considering high tunnel production should first do some preliminary research. A good place to begin is to read the resources listed below and the linked eOrganic articles. Next, the farmer should develop a crop production plan for the tunnel. Whenever possible, farmers should seek advice from growers in their region with experience growing in high tunnels. Center for Plasticulture: High tunnels [Online]. College of Agricultural Science at Penn State University. Available at: http://plasticulture.cas.psu.edu/H-tunnels.html (verified 4 March 2010). High tunnels: using low-cost technology to increase yields, improve quality, and extend the season. T. Blomgren, T. Frisch and S. Moore. [Online] (n.d.) University of Vermont Center for Sustainable Agriculuture, Burlington, VT. Available at: http://www.uvm.edu/vtvegandberry/Videos/hightunnelvideo.html (verified 4 March 2010). This guide includes organic-specific information, including organic farm case studies. There is also an accompanying video available for purchase. High tunnel production manual, 2nd Edition. 2003. W. Lamont. Pennsylvania State University. Available for purchase at: http://plasticulture.cas.psu.edu/manual.htm (verified 4 March 2010). This is a conventional production guide that includes one chapter on transitioning a tunnel to organic production. Hightunnels.org [Online]. K-state Research and Extension, University of Missouri Extension and University of Nebraska Cooperative Extension. Available at: http://www.hightunnels.org (verified 4 March 2010). Website describing conventional high tunnel construction and management in the Central Great Plains. Minnesota high tunnel production manual for commercial growers [Online]. T. Nennich, D. Wildung, and P. Johnson. 2004. University of Minnesota Extension Bulletin M1218. Available at: http://hightunnels.cfans.umn.edu/files/2012/11/1-Cover-and-Preface.pdf (verified 4 March 2010). This is a conventional production guide that includes a chapter on organic certification compliance.